We offer many products with educational and/or quantity pricing including but not limited to HP toner cartridges, Adobe software, and Symantec Norton Antivirus software. We offer quantity discounts on ink cartridges, CD-R and CD-RW media, Zip Cartridges, etc. Microsoft, Adobe and Symantec software licensing can save you big money over retail purchases. Call us to see how much! 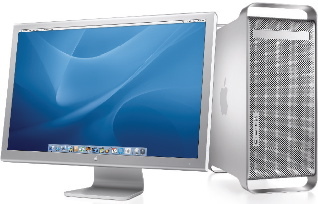 Power Macintosh G5s, Servers, iMacs, Mac Minis, Powerbook G4s, iBooks, iPods, Airport hardware and Apple displays are some of the Apple products we handle. Ask about AppleCare extended warranty on Apple Products! We sell Acer PCs running Windows XP Home or XP Professional at competitive prices -- most with a 3 year warranty. We can custom configure systems to meet your needs. We also sell servers and the whole line of award-winning Acer notebooks. Schools are eligible for educational pricing on Acer notebooks, Acer Veritons and Acer Power machines. We repair all of Apple's previous and current products. Applecare service contracts are available on Apple equipment still within the original warranty period. Hardware, OS, and software problems are no problem for us. For PCs, we service what we sell and are experienced with several other Windows-based brands. Extended service contracts are available on most new equipment to protect your investment. Hewlett Packard inkjet and Laserjet printers are excellent workhorses for all your printing needs. Epson makes great quality single-station or network inkjet printers. Okidata makes high performance printers at an affordable price. Attractive extended warranty options are available for these printers as well. We carry a wide variety of ink and toner cartridges for HP, Apple, Okidata, and Epson printers as well as various papers, floppy disks, zip disks, tape cartridges, CD media, DVD media, batteries, and picture cards. We offer quantity discounts on most of these items. HP and Epson scanners provide great scanning quality at affordable prices. Nikon, Sony and Kodak digital cameras make an excellent addition to your digital workplace with the capability of adding pictures to documents in minutes. Most of these cameras and scanners are also cross-platform devices that can be used regardless if you operate Macs, PCs or both. Optoma projectors are an excellent choice for your projection needs with their brilliant pictures, robust sound, included cables, 3 year warranty and handy features. We offer several models to choose from to fit your needs and budget. We provide upgrades for your existing equipment whether you need more RAM memory, hard drive or other storage space, extra peripherals, larger monitors, modems, NICs, newer software or other items! Configuring dial-up, DSL or network internet access can be a real chore -- why not let us set you up right with the best configuration for your situation? We can also assist in getting your business on-line if you aren't there yet or we can help protect your home or business from hackers, viruses, adware and spyware with routers, firewalls, software, etc. To take some of the guesswork out of what to buy, we offer high quality, versatile, cross-platform monitors, DV camcorders, cables (USB, parallel, serial, SCSI, audio, video, network, power), hubs (USB, Ethernet), switches, hard drives and CD/CD-RW (IDE, SCSI, Firewire, USB), removable storage drives (Zip, Jaz), memory (SIMMS, DIMMS, SODIMMS, SDRAM), surge protectors, battery backups, keyboards (PS/2, USB, Din5, ADB), mice (USB, PS/2, Serial, ADB), mouse pads, laptop carrying cases, speakers, etc. Other items we carry include modems, network cards, software (antivirus, utilities, programs, games), DVD drives, digital flash drives, card readers, and tape drives. Our staff is certified on Ethernet and fiber cable installation. We have many years of experience installing and certifying networks in schools and businesses. 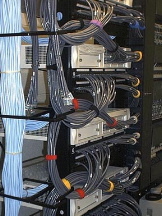 We offer an entire array of networking components including hubs, switches, routers, CSU/DSUs, racks and rack mount equipment, cabling, cable ends, surface mount channel and boxes, networking tools, network cards, SonicWall firewall products with optional filtering, and SnapServers for those extra network storage requirements.